There’s no substitute for your feet in terms of mobility; in fact, the simple and natural ability to use one’s feet is tantamount to physical independence for most people. Your feet deserve some extra care and attention in order to do their job and consistently function well. Don’t miss these helpful tips and best practices for maintaining healthy and hygienic feet. Do you ever inspect your feet? If you don’t, start today. Inspecting your feet regularly helps you to detect foot problems earlier and prevent them from getting worse. Set a specific time daily to inspect your feet. This is especially crucial for people with circulation problems (like those with diabetes) as a minor cut or laceration left unattended can lead to a severe infection. People who engage in high impact physical activities are also encouraged to do a routine feet inspection. Use a lamp to provide adequate lighting for your feet inspection. Take note of your feet’s appearance, color, and texture. You can also check the range-of-motion of your feet and note any form of discomfort or pain, which might indicate an overuse injury. If you notice any untoward sign like changes in appearance, color and texture, consult a doctor or a podiatrist; even simple changes can indicate a foot infection or underlying medical problem such as diabetes or arthritis. After a long day of doing work or engaging in sports activities, your feet can become tired and sweaty. Your moist feet and cramped space of your shoes are conducive to fungal infections such as athlete’s foot. Maintain good foot hygiene by routinely scrubbing and massaging the soles of your feet. Doing so can remove dead skin, prevent infection, ease muscle tension, relieve fatigue, and promote better blood circulation. For a more relaxing effect, you can soak your feet in a basin of warm water for at least 10 minutes before scrubbing your feet gently. Don’t forget to dry your feet thoroughly after washing them; pay particular attention to the area between your toes. 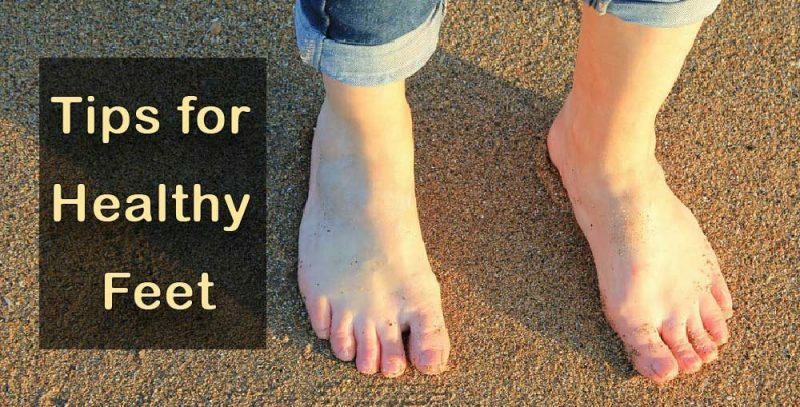 Although walking barefoot, also known as Earthing or grounding, has some natural health benefits akin to basking in sunshine, breathing fresh air, drinking clean water, and eating nutritious foods, it is generally not the safest for your feet. When you walk barefoot, especially outdoors, there’s a chance that you might contract a hookworm infection or sustain minor foot injuries since your feet are exposed to stepping on the sharp edges of rocks, fragments of glass, and rusty nails. Don’t forget your feet when you apply sunscreen, most especially if you wear skin-baring shoes on a hot summer day. Applying sunscreen helps prevent sunburn and reduce your risk of skin cancer. Use a sunscreen with an SPF of 30 to 50 and apply it religiously to your feet especially when you only wear flip-flops or sandals. Sunscreen lotions, especially those with moisturizers, can also prevent fissures from forming in your heels. Having a healthy pair of feet also depends on the type of shoes you wear. Wearing ill-fitting shoes can lead to foot injuries like blisters, bunions, and calluses. It can also make you feel uncomfortable and affect your gait and balance. To determine what shoes to wear, consider the activities that you will do for the day. Wear running shoes if you will go running, hiking shoes for hiking, and basketball shoes for playing basketball. These shoes are specifically designed to meet your feet’s needs as you perform these activities. Aside from wearing the appropriate type of shoes for your physical activity, you should also avoid wearing worn out shoes with peeling and thin soles as these can harm your feet and increase your risk of injury. Having long toenails can be fashionable especially for women. However, if you are an active person and always wear closed shoes, long toenails can lead to injuries such as cuts and cracked and ingrown toenails. Cut your toenails across and file away any sharp corners and edges using a nail file or an emery board. It’s easy to overlook your feet until you feel some discomfort. If you notice any sign of infection or a wound that doesn’t heal, consult your doctor immediately.